If this were a weighty, scholarly volume, we might be put off by such a burdensome claim. 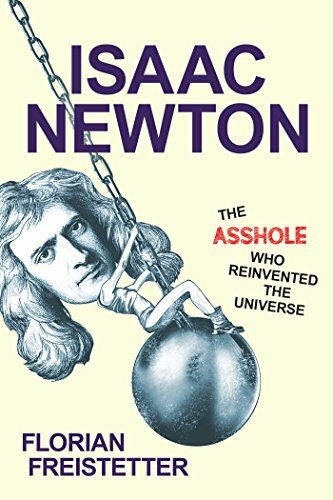 But this is a slim, captivating tribute to one of the author’s heroes, driven by colloquial language, good cheer, and sound advice on how science should work today. Freistetter offers ample evidence supporting his claim that Newton had an abrasive personality. Whether this abrasiveness inspired his work, as he further claims, is less convincing. At times, it seems that collaboration and compromise might have better served him. Of course, there’s no way to know. And as you get caught up in Newton’s adventures in curiosity, the argument soon becomes secondary. What matters most is Newton’s unquenchable quest for knowledge—and how it sparks our own curiosity. The breadth of Newton’s interests and achievements are astounding. He was a warden of the royal mint and worked to stop counterfeiting. He studied astronomy, explaining through abstract math how the moon and sun affect the tides. He refined the telescope. He calculated that gravity is a universal force, and not by simply watching an apple fall. He even studied religion, trying to explain God from a heretic’s perspective. Perhaps most important, he wrote Principia, the text that shaped the very language of physics. That Freistetter in such a slim book is able to address each of these pursuits with nuance and depth is nothing less than remarkable. It’s our responsibility then to pay attention, to stay informed, to learn how to parse evidence from spin. And this book is one good starting point in that quest. Tony Romano is a staff reviewer for NY Journal of Books.